The spirit of the great british band leaders of the 1920’s and 1930’s Jack Hylton, Ambrose, Henry Hall is very much alive and jumping with Graham Dalby and The Grahamophones. Graham Dalby and his Orchestra / The Grahamophones have provided the music for the BBC series Mrs Bradley Murder Mysteries, performed at The Hong Kong Arts Festival and The 1997 Handover, played at Windsor for H.M. The Queen Mother’s 100th, and have been the subject of a BBC TV documentary. Just a tiny taste of 25 years of music making. 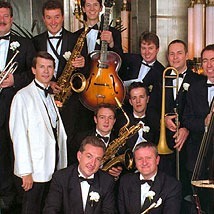 Recently renamed The London Swing Orchestra, Graham Dalby’s orchestra is a jazz age swing band, leading exponents in the re-creation and interpretation of original arrangements of popular music from the great dance band days. BBC and film sessions for Graham have included Hans Zimmer’s Crimson Tide and The Peacemaker, Evita with Madonna and The Muppet Treasure Island. In 1987 Graham and his orchestra signed a deal with President Records and released their first album We’re Tops On Saturday Night and were invited to perform at many international arts festivals. Subsequent recordings with President Records are Mad Dogs and Englishmen (1988), Let’s Do It Again (1990) and Transatlantique (1993). Graham also included original compositions such as ‘ I Would Sooner Be A Crooner’ which he and The Grahamophones were filmed performing in the Alec Guiness film A Handful Of Dust (though the soundtrack is a George Fenton overdub).